Young adolescents (aged 10 to 14 years) have a very important role in the lives and the health of their younger brothers and sisters; as their carers. We have seen all over the world, children of this age carrying the baby on their back, feeding the baby, playing with the baby. This caring role is often done by an older sister and it often goes unsupported and unrecognised. In the places and programmes where we work, we aim to shine a light on this role. When helped to identify this role, it is quite easy to get important adults in the children’s lives like their parents, neighbours, teachers and faith leaders – to recognise and then praise the children. A lot of what Children for Health helps to do is to inform this role so that it becomes supported, educational and thus beneficial for the child who is caring. While information such as good weaning foods to give baby – is important – the recognition that young carers get is important too. In our programme in Mozambique, parents have started to describe the young adolescents helping to improve the nutritional status of the under 5’s in families in the community – as their ‘heroes’. The teachers we are working with in Lagos are impressed at the efficiency with which 10-12 year old children are able to learn and then share 10 key health messages linked to diarrhoea prevention and control. Although the teachers in this programme have been ‘trained’ the crucial distinction between a traditional health education approach and this approach is that information and activities are linked to the real life of families and (as part of the process) the young adolescents bring their real life experience to the games and discussions facilitated by the teachers. It’s not that hard for teachers and others to make that switch but equally it doesn’t happen without that switch! Often that switch is about giving teachers and others the support and confidence to sit and work on problems WITH the young adolescents rather than FOR the adolescents and this is just about an adjustment in style of teaching – from a teacher-centred approach to one which uses facilitation and coaching. We find ‘coaching’ a useful concept in our work as coaching is about placing the power into the hands of the ‘learner’. The coach enables the learner to problem solve thus developing transferable lifeskills even when working on a specific health issue, like breastfeeding. 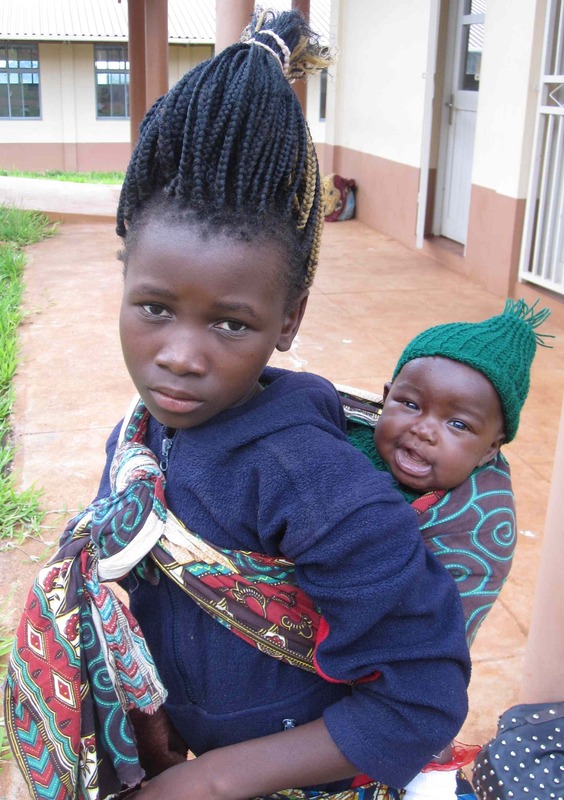 Emma 10 with her baby sister, Sylvia at a Children for Health training workshop in Tsangano, Mozambique. Interested in this? Contact us to find out more how we help programmes develop good practice and promote the participation and engagement of young adolescents in health education and health promotion. You may be interested to find out more about our 10 messages for children to learn and share linked to our first ‘Foundation Topic’ – ‘Caring for Babies and Young Children’. In January, the first month of the year, we like to promote our 10 messages on this topic. Download our 100 messages PDF here. For more information on activities linked to this topic on our website, click here. In February we will be focusing on work linked to Coughs, Colds and Pneumonia – and what children can do. ‹ Evidence Re: Children’s Participation in Health & Development?